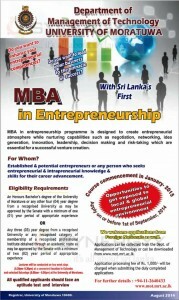 MBA in entrepreneurship programme is designed to create entrepreneurial atmosphere while nurturing capabilities such as negotiation, networking, idea generation, innovation, leadership, decision making and risk-taking which are essential for a successful venture creation. Established & potential entrepreneurs or any person who seeks entrepreneurial & intrapreneurial knowledge & skills for their career advancement. 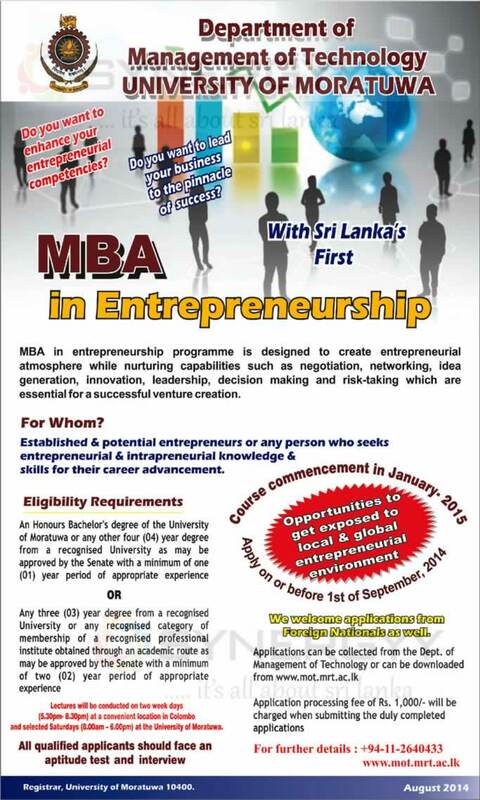 Lectures will be conducted on two week days (5.30pm- 8.30pm] at a convenient location in Colombo and selected Saturdays (8.00am – 6.00pm) at the University of Moratuwa. Is Kotalawala Defence University shifting to Suriyawewa?